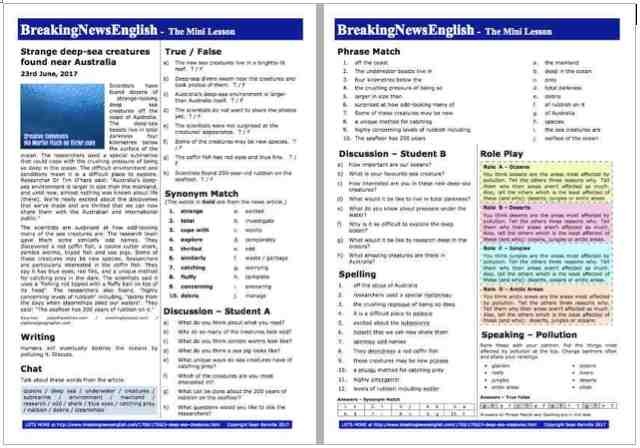 Try easier levels of this lesson: Deep-Sea Creatures - Level 4 or Deep-Sea Creatures - Level 5. Scientists have found dozens of strange-looking deep-sea creatures off the coast of Australia. The underwater beasts live in total darkness four kilometres below the surface of the ocean. The researchers used a special submarine that could cope with the crushing pressure of being so deep in the ocean. The difficult environment and conditions mean it is a difficult place to explore. Researcher Dr Tim O'Hara said: "Australia's deep-sea environment is larger in size than the mainland, and until now, almost nothing was known about life [there]. We're really excited about the discoveries that we've made and are thrilled that we can now share them with the Australian and international public." The scientists are surprised at how odd-looking many of the sea creatures are. The research team gave them some similarly odd names. They discovered a red coffin fish, a cookie cutter shark, zombie worms, tripod fish and sea pigs. Some of these creatures may be new species. Researchers are particularly interested in the coffin fish. They say it has blue eyes, red fins, and a unique method for catching prey in the dark. The scientists said it uses a "fishing rod tipped with a fluffy bait on top of its head". The researchers also found, "highly concerning levels of rubbish" including, "debris from the days when steamships plied our waters". They said: "The seafloor has 200 years of rubbish on it."